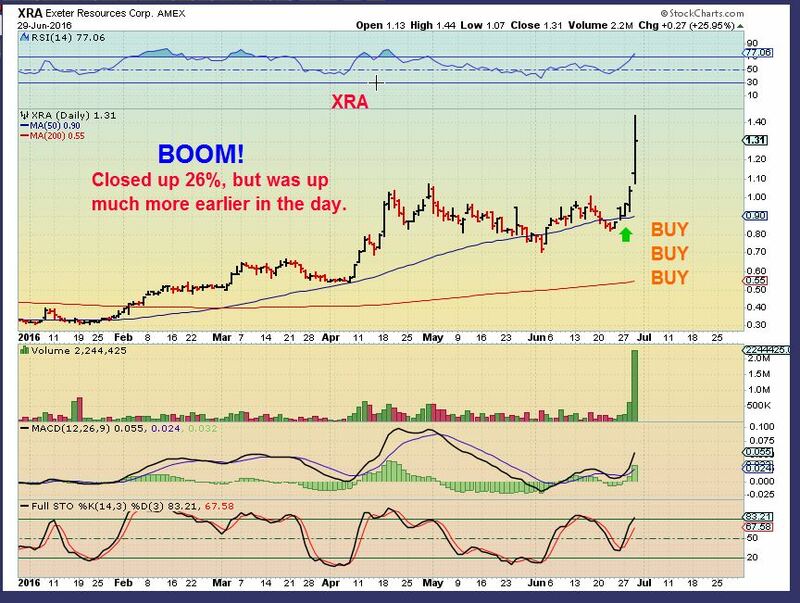 XRA - On June 27th, I mentioned that this is an explosive set up, and showed a few reasons why. I was buying . I then posted this on the 28th. 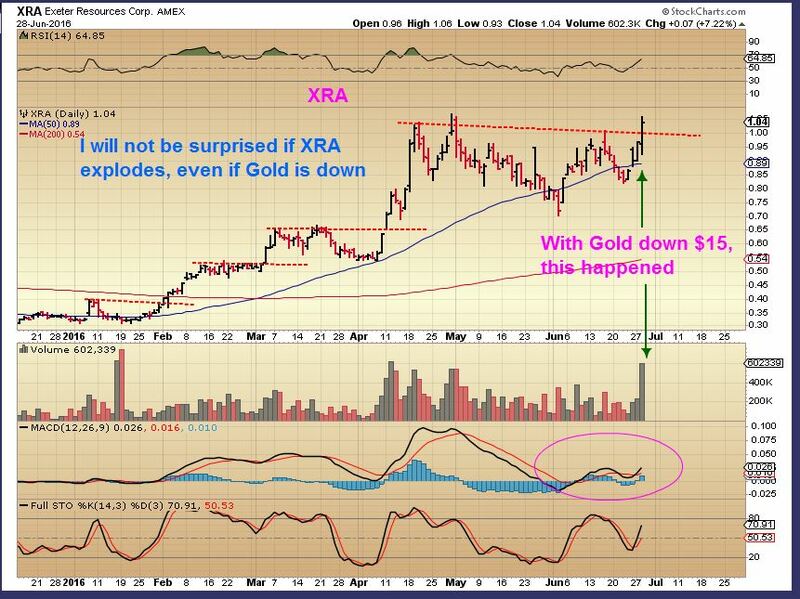 With Gold down $15, XRA powered higher. Last chance to get in? And then Wednesday- BOOM! - just like the VGZ and MUX trades, this exploded higher. Up 26% at the close. Your past steps have moved you to where you are today, your next steps are just as important. Allow me to walk you through a look at what Chartfreak readers were hearing before & after the Brexit vote. Those steps brought us to where we are now. I’ll also show what we currently see when it comes to Precious Metals. 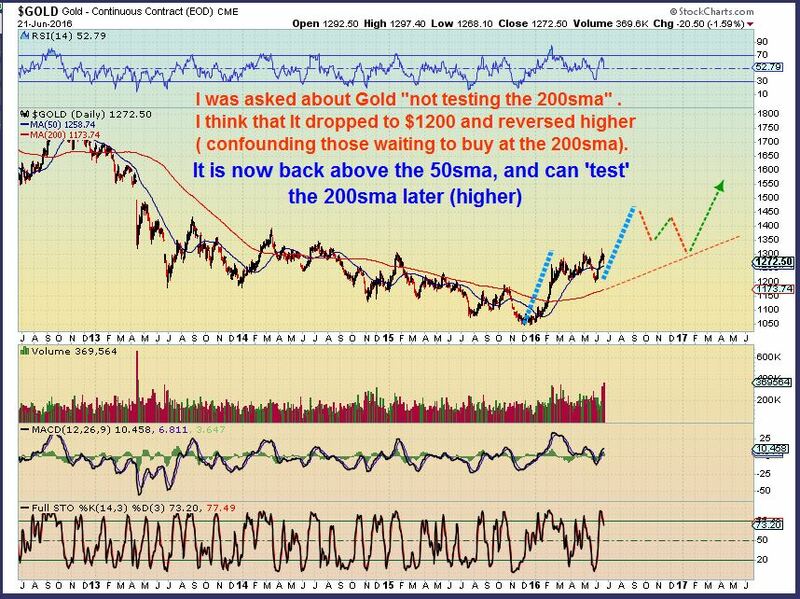 I kept reading everywhere in Late April / Early May that Gold had to plunge down and tag the 200sma before it could move higher. Why? 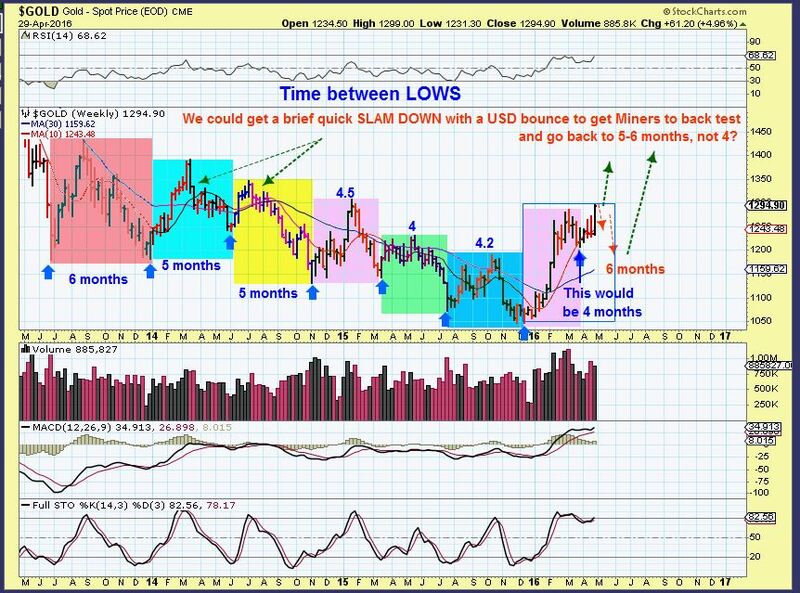 Many thought that Gold was overextended. I agreed that it could, but I also pointed out that Cycle Timing caused me to be looking for a very important low imminently. I drew a drop to $1200 area, but mentioned that $1170 was possible too. As we dropped to the $1200 area , Fib #’s and ‘ Cycle Timing’ came into play. I was looking for a low. I then called a possible low at the $1205 area with capitulation type selling scaring everyone away and causing a lot of ‘fear’ talk. I mentioned that I couldn’t tell for sure, but I think that the lows were in or at least a buy-able bounce with that reversal. I began buying Miners 4 weeks ago, at the end of May. This was day 3 of the lows, and an extremely low jobs report was released. Gold blasted off higher. A close above the blue line would confirm my idea of deep meaningful lows ( An ICL). I was asked in an email, “What about all those saying that the 200sma needed to be tagged?” I agreed that that ‘tag’ could come, but did it have to be in May? I said No, and drew this idea.nThe Tag could come later and when the 200sma is actually higher. 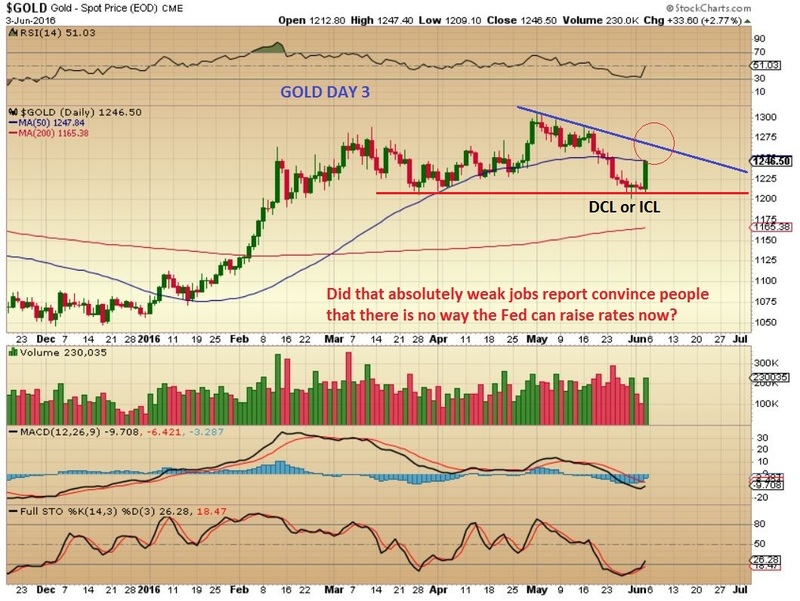 Gold was now a bullish set up and was running out from an ICL. 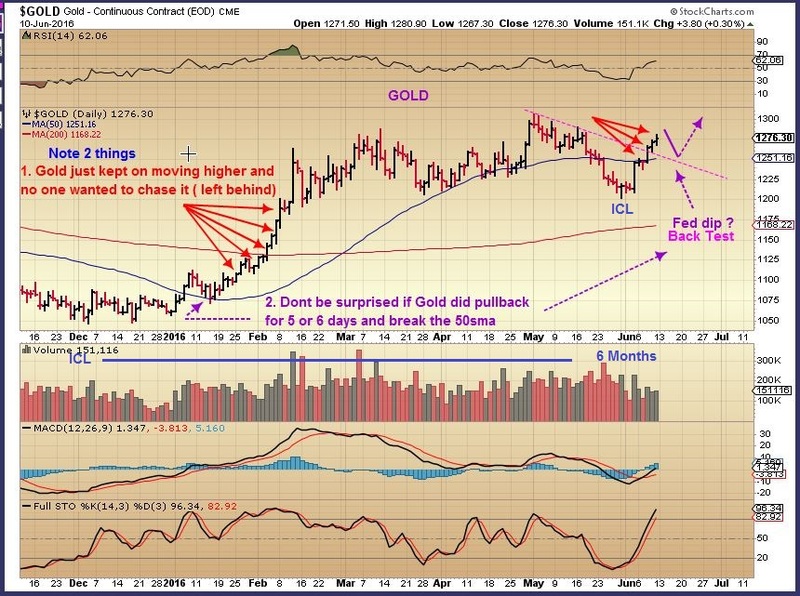 We actually had a consolidation from FEB to June, for those thinking that Gold was overextended. It isn’t, it had gone sideways for months. 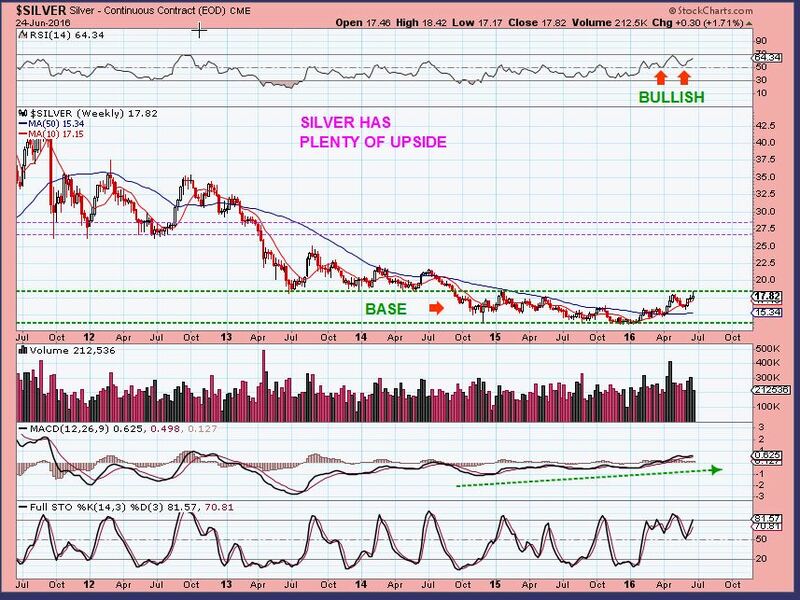 Silver stocks have doubled and tripled, is the move in Silver & silver stocks done? This is a great looking base if you ask me, and only the beginning in the long run. 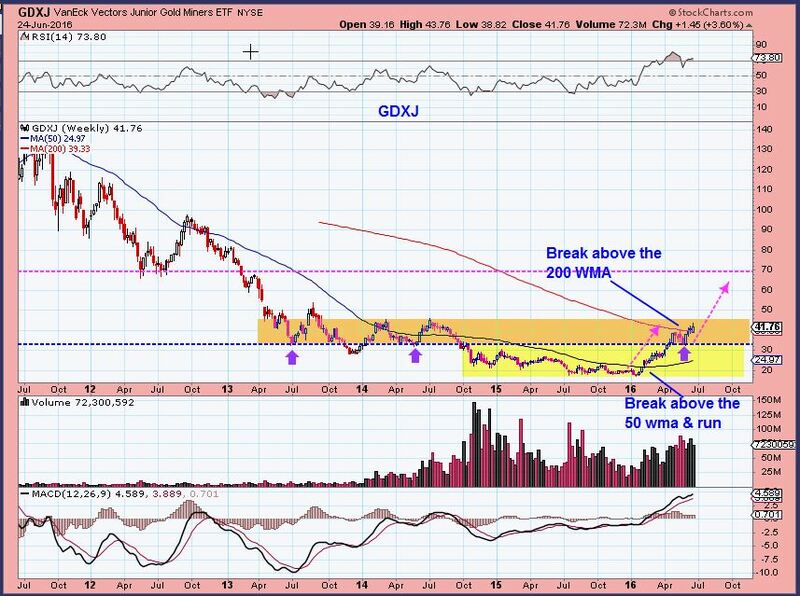 And GDX & GDXJ have had great runs higher too, but that may be just the beginning. Timing a trade is important though. Now I want to walk you through a few trades, and show you a current trade that I think will play out well. 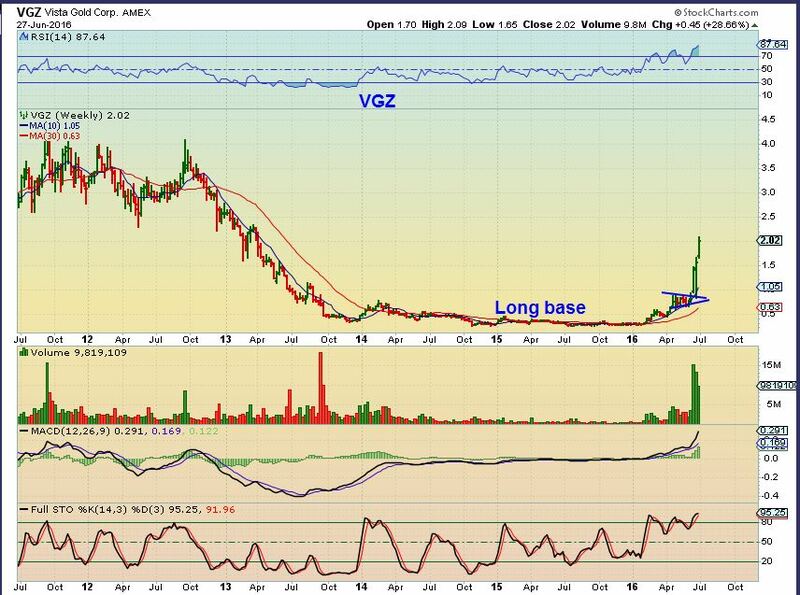 I recommended VGZ and MUX before they exploded higher. I didn’t offer an exact entry or exit, just that I had bought them a bit earlier and they were looking at a possible explosive set up. 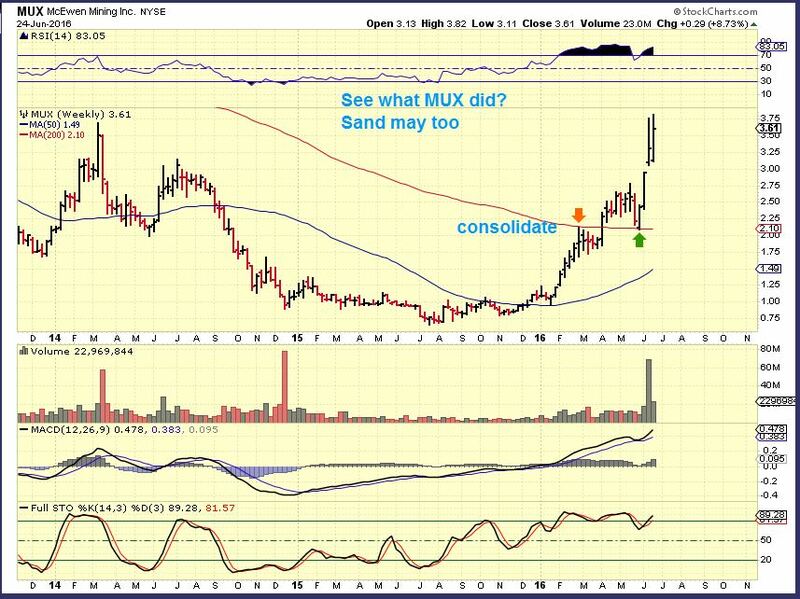 MUX – I had mentioned to my readers that I had been buying Miners and bought MUX in May at the 50sma near $2.25. 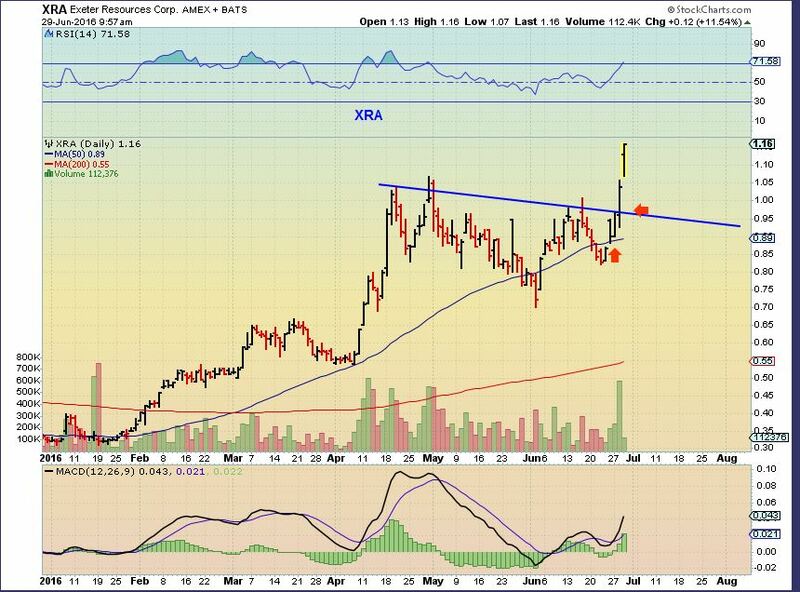 June 12 it was now breaking out from a constructive consolidation with great volume. Even at this point it was a buy-able break out. MUX popped and ran very strongly. It remains near $3.75 consolidating recent gains. 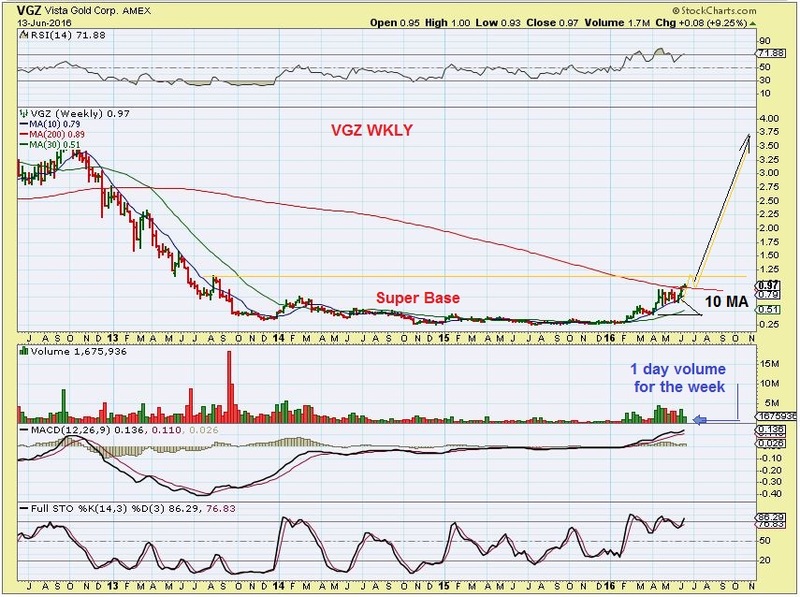 JUNE 13th – VGZ was at $0.97 . I bought this consolidation and mentioned that I thought Golds ICL was in, Miners should be bought. Dont go ‘all in’, but it was a great trade set up as shown. It had a super base. 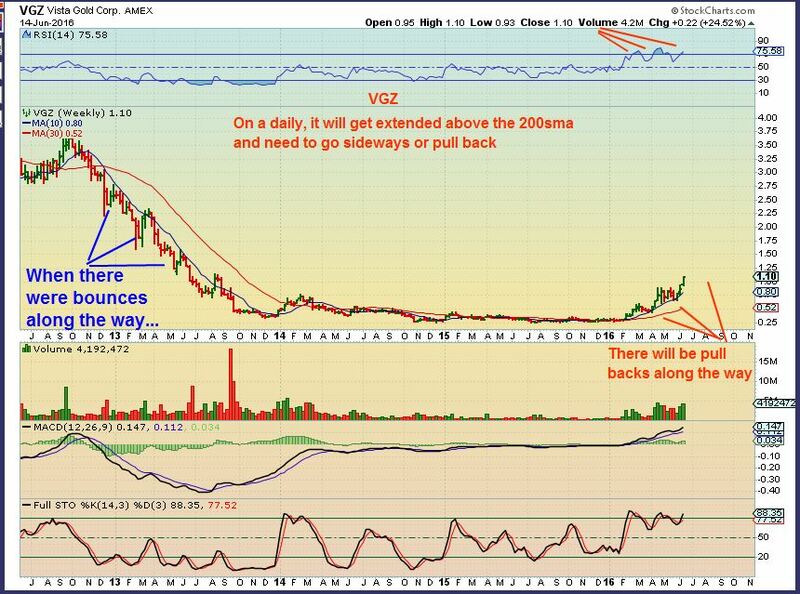 VGZ at $2.02. Gains of over 100% in 2 weeks. That leads me to today. When those positions get extended, I like to sell at least 1/2 and look for other similar set ups. 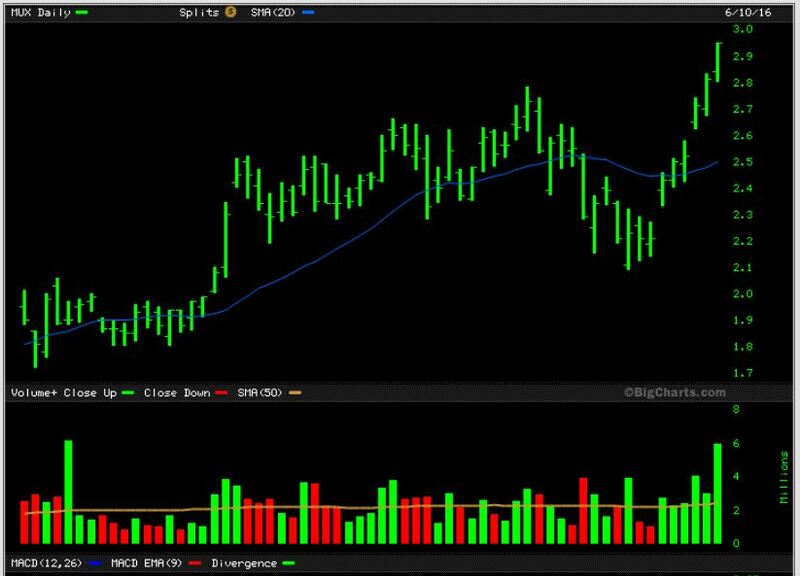 I pointed out this stock Monday and even with fundamentals that are not ideal- the set up is perfect again. 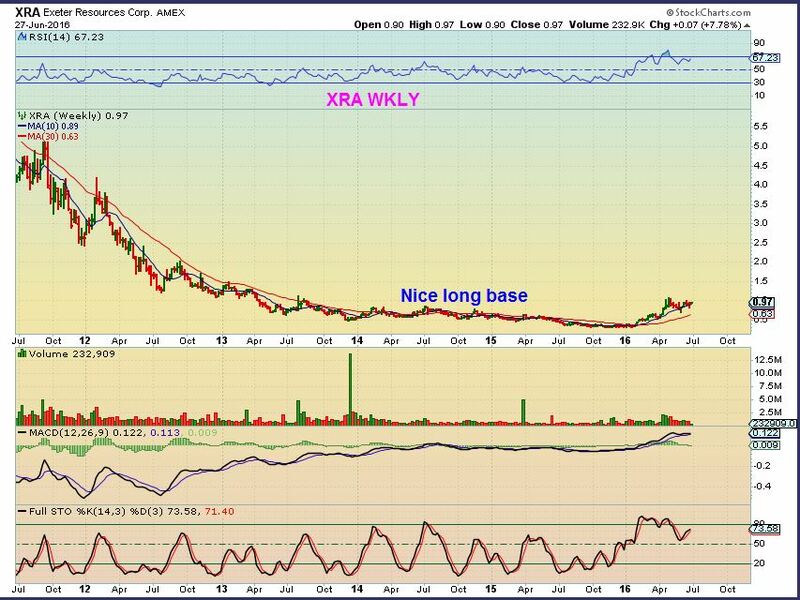 XRA – It wasn’t just the recent consolidation and set up that I liked, I also pointed out that another super base adds relevance. Does this base look a bit like the chart that follows it to you? 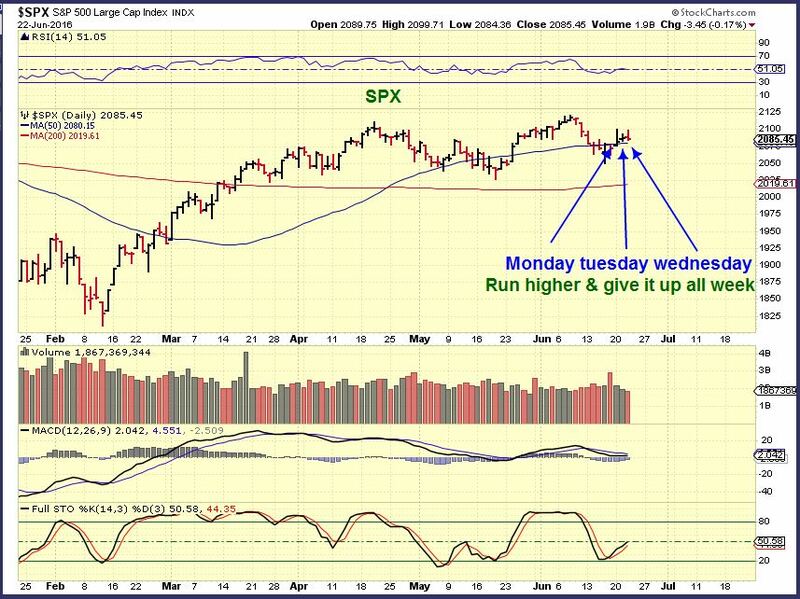 Tuesday June 28 – So again, I had already posted XRA, but I posted it again in todays report. This is an explosive looking set up, even if one just took it for a quick trade on a possible break out. 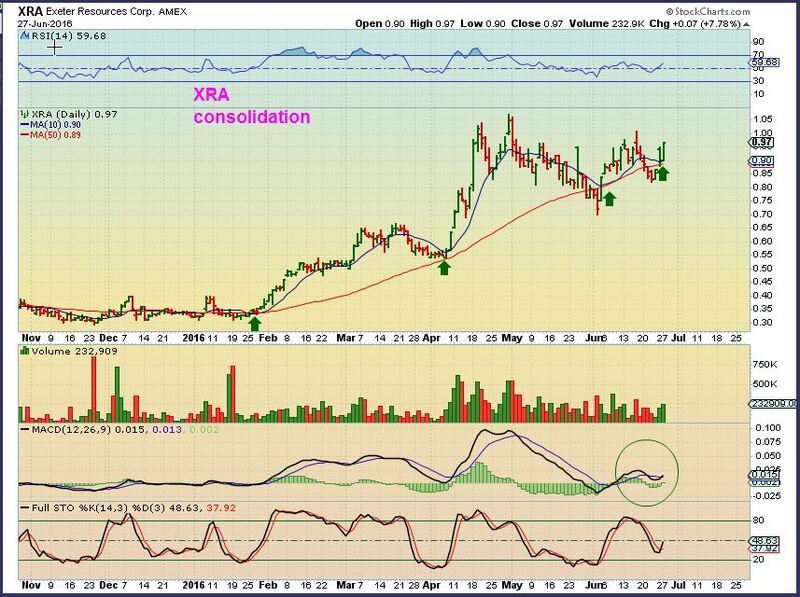 XRA June 29 as I write this report, XRA is up another 13% today. Actually , it just popped up 20% as I was writing. 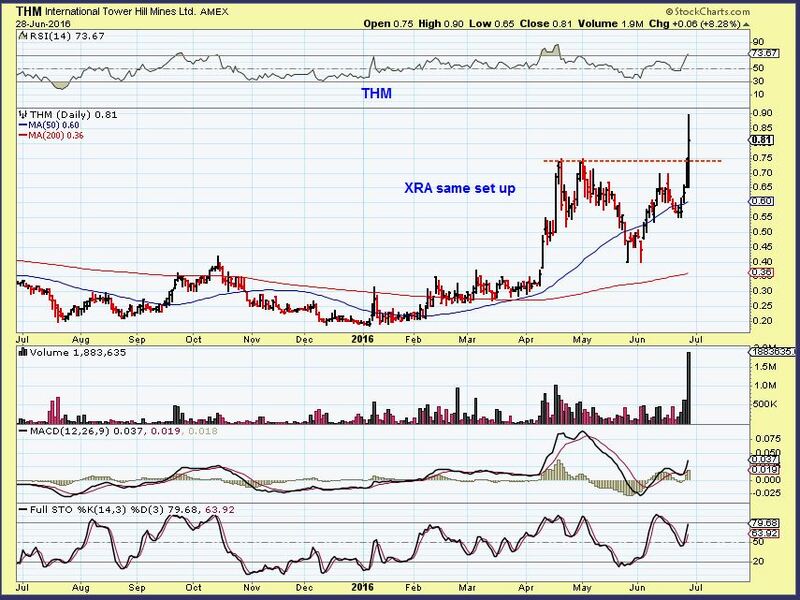 THM – I pointed out another one just like it Monday at 75 cents, what a nice set up. Watch these run. 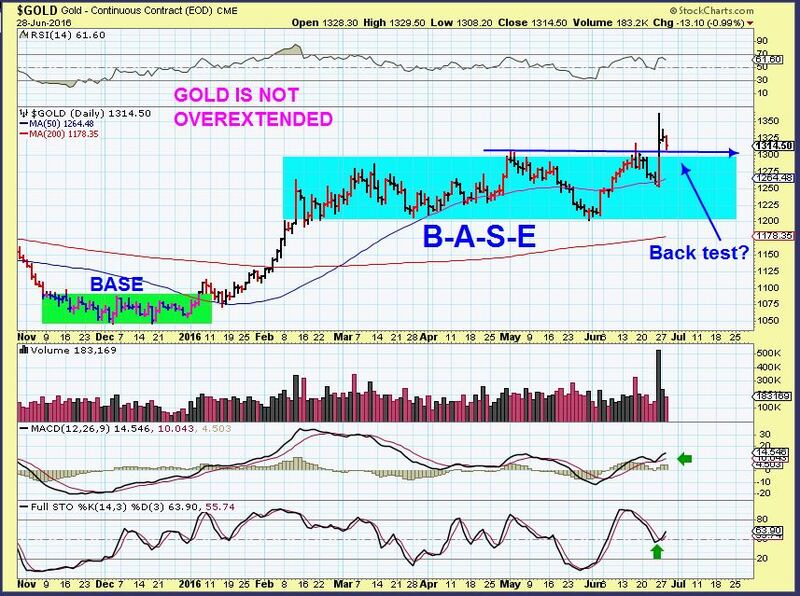 I am constantly searching for what I know to be explosive set ups in the bullish market sectors, Right now I am bullish on Precious metals and the set ups look very nice. So did you buy VGZ, MUX, ASM before they broke out? Are you in XRA today? Not every trade works out with 20% gains day after day, but these recent gains are seriously helpful to the portfolio. For example, I also recommended SAND & BTG over the past 2 weeks and with small gains, SAND backed up yesterday on a public offering. Not a big deal, down 7% and I am actually still bullish on SAND, but I just wanted to point out that not every great set up works right away. A small position in the ones that do make up for any that do not however. Honestly, other miners recommended are doing well too, and still others are currently ‘setting up’ for possible future explosive moves. I will keep premium members posted when I see these bullish set ups. I do see a few more currently acting correctly. Why not get an extra set of eyes by trying chartfreak for a month? One trade may pay for that month. Thanks for reading along, and best wishes! SPX- The positive side....the weekly chart ( yes, it is only Tuesday) would shape up nicely if we held here or continued higher. That's a big 'if'. June 25 Weekend Report … KA-Boom! 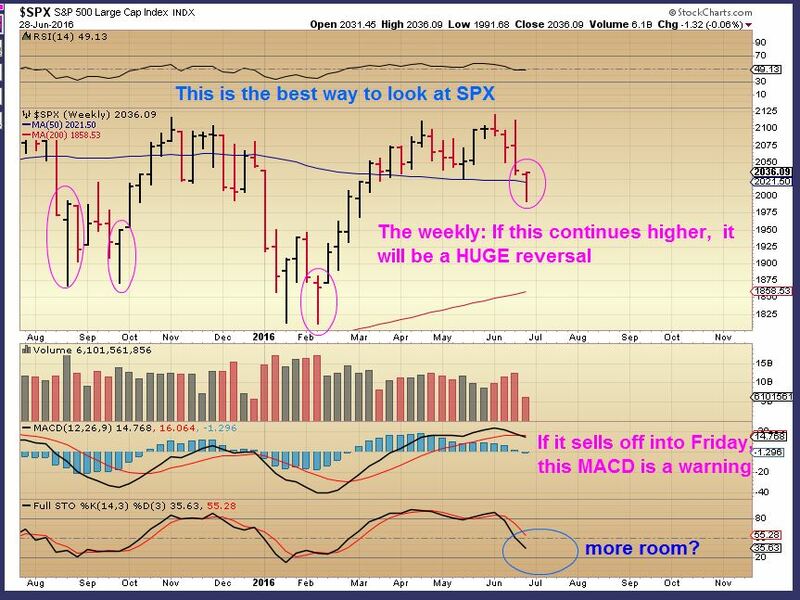 Last week the General markets went through a period of indecision. Each morning the futures were green, then the markets sold off into the close. We had the Fed giving testimony to congress and the Brexit Vote scheduled for the end of the week. 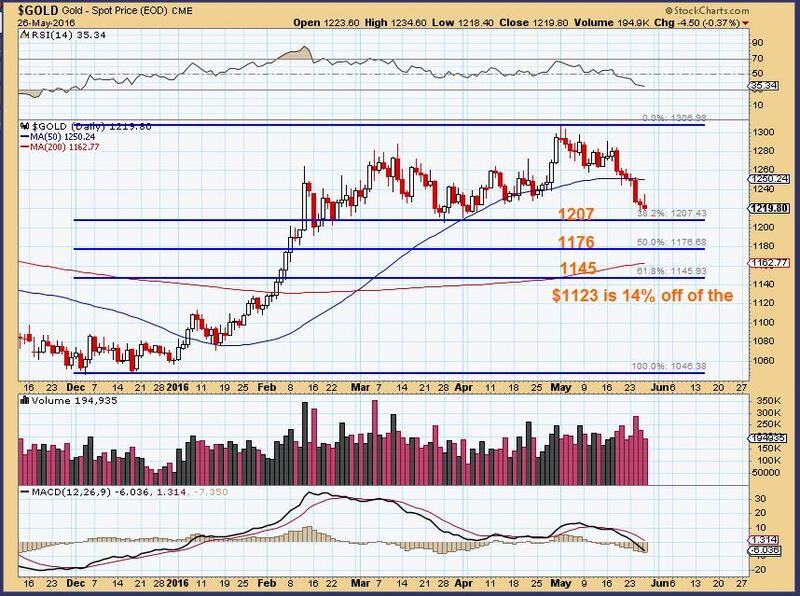 After the Brexit vote, the future went Ka-Boom, with Gold up almost $100 at one point, and the general markets ( in the US/ and globally) panicked. 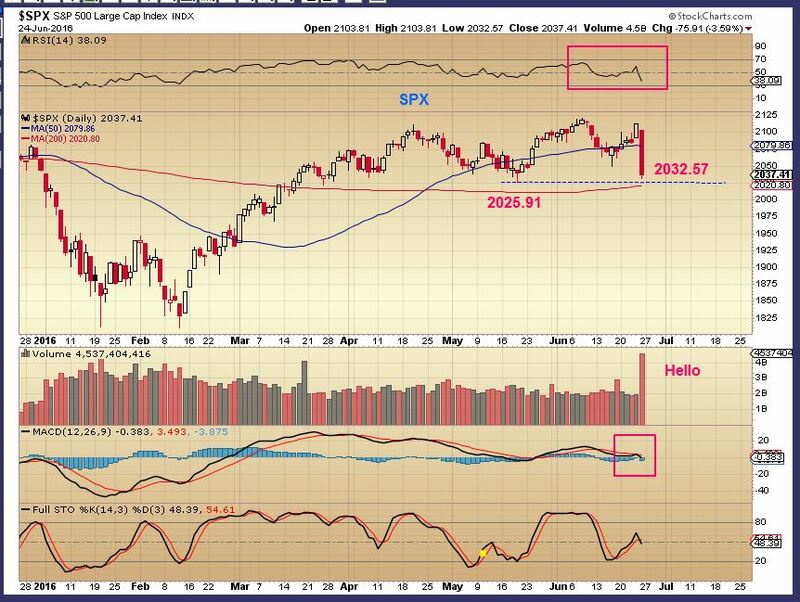 SPX - The Dow closed down over 600 points, the NASDAQ was down over 200 points, and the Spx was down about 76 points. That is a rather ugly candle. https://chartfreak.com/wp-content/uploads/sites/6/2013/04/black_logo.png 0 0 Alex - Chart Freak https://chartfreak.com/wp-content/uploads/sites/6/2013/04/black_logo.png Alex - Chart Freak2016-06-26 22:29:212016-06-26 22:29:50June 25 Weekend Report ... KA-Boom! 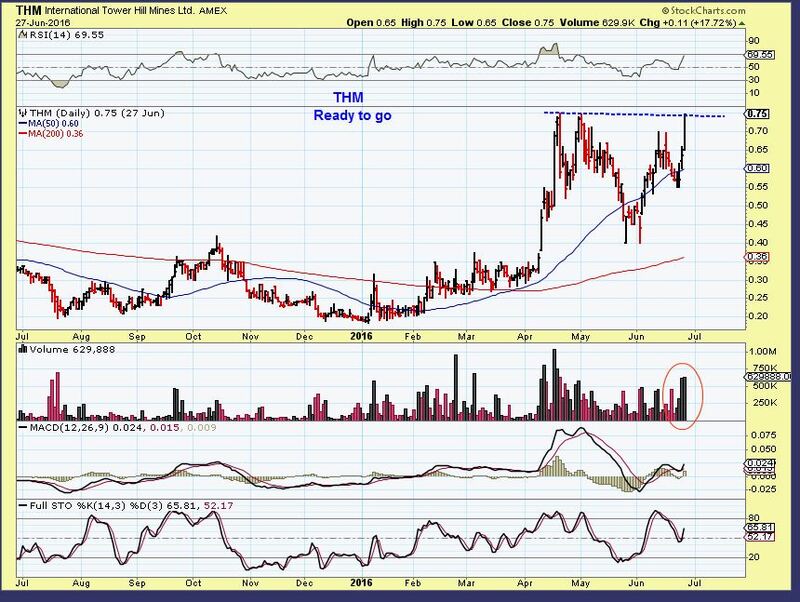 At Chartfreak, I announced that I thought the next important low (ICL) was in for Gold 3 weeks ago and began to buy miners. 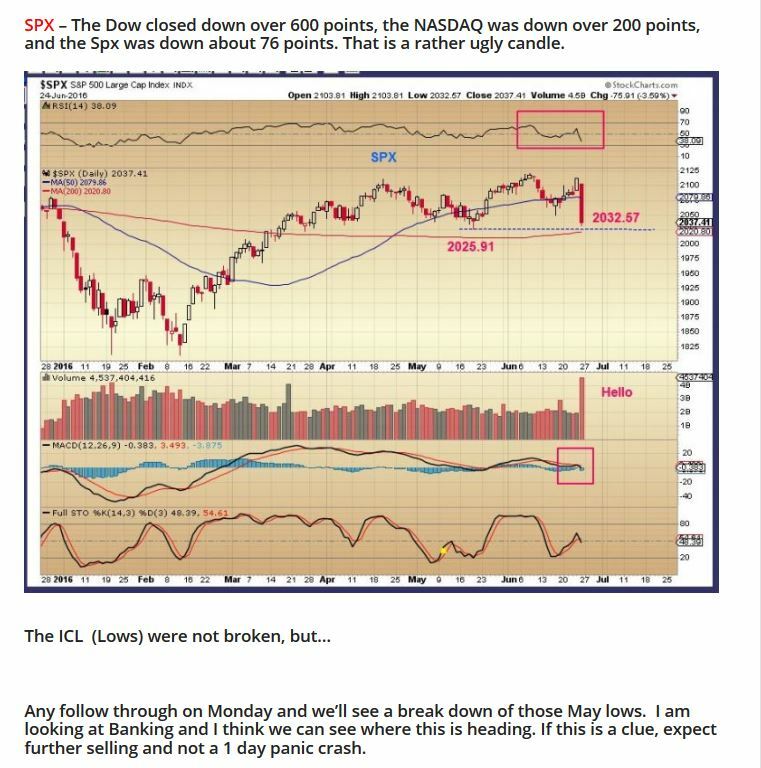 Confirmation of that ICL came a little while later with a trend line break and a few other factors. 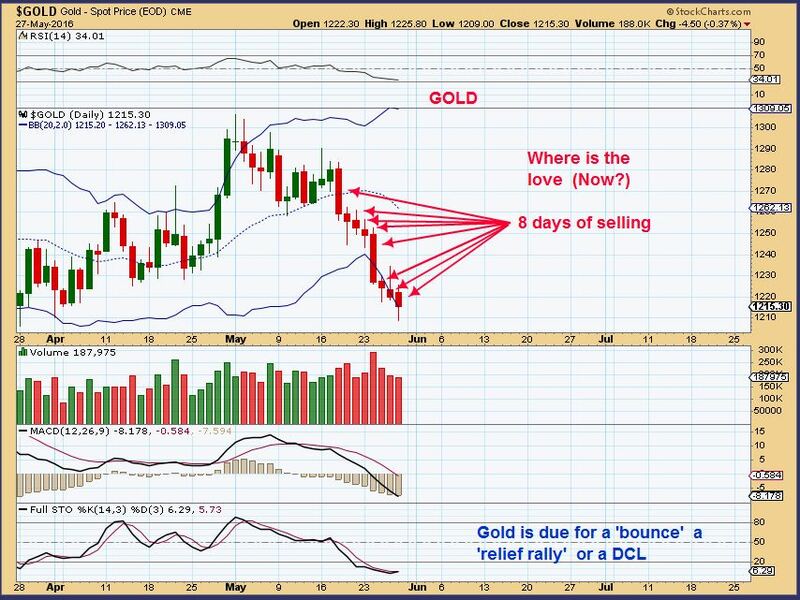 I drew these expectation in my Gold chart for June 14th, a possible run to $1400+. While the BREXIT vote was going on Thursday, I decided to take a snap shot of Gold before I left for dinner. This is where we were at. I also thought that we could tag or slightly break the 50sma ( shake out) and then move higher. We hit the $1255ish area, just below the 50sma. Later Thursday night, this is what we had. Unbelievable! Gold was up $85, and the Dow Futures were down $677. The NIKKEI was down $1430 ! The US Dollar was up almost 3! 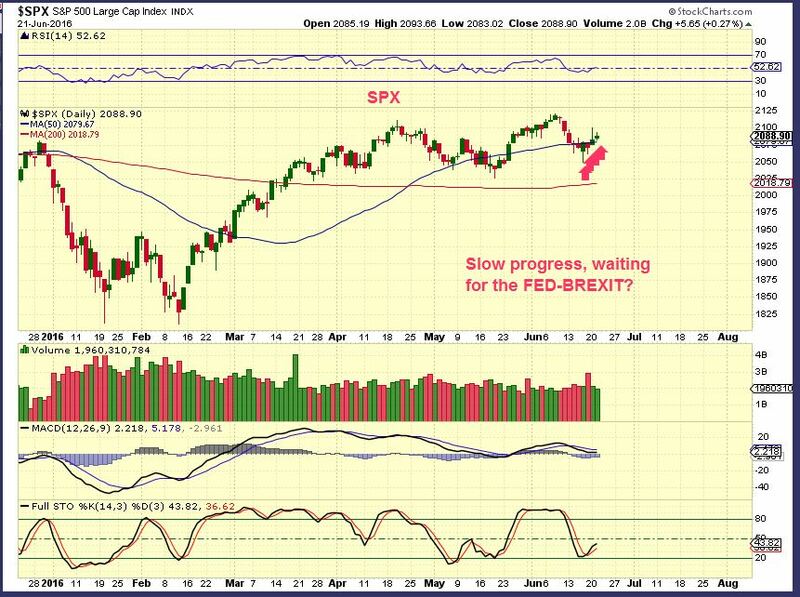 SPX - Not very dramatic so far, but it is holding above the 50sma and remains close to former highs. What else have we seen this week? https://chartfreak.com/wp-content/uploads/sites/18/2016/06/BREXIT.jpg 447 1178 Alex - Chart Freak https://chartfreak.com/wp-content/uploads/sites/6/2013/04/black_logo.png Alex - Chart Freak2016-06-23 11:35:232016-06-23 11:35:23Here It Comes! Monday we awoke to a Gold and Silver slam down, and the futures for just about everything else was pointing to a higher open. 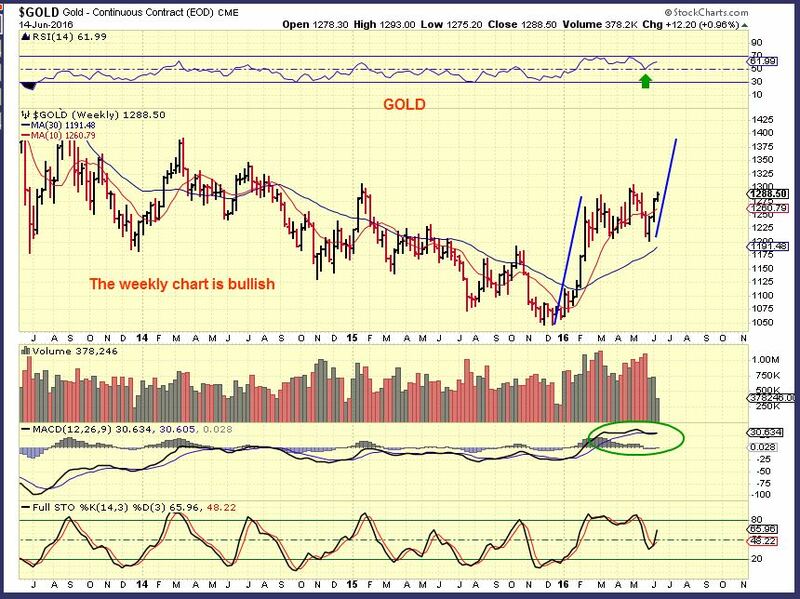 As the day went on, Gold and silver went higher and the general markets sold off into the close. Tuesday, the futures show pretty much the same. Will today bring what we saw yesterday? Janet Yellen is testifying before congress on Tuesday and Wednesday, and Thursday is the Brexit vote, so it seems that many do not want to commit ahead of time, we may just get more of the same. 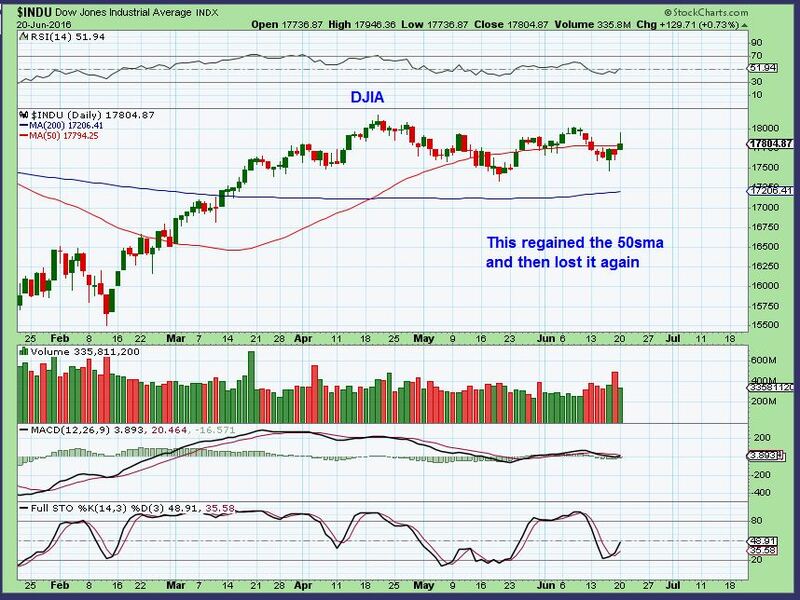 DJIA- The Dow regained the 50sma intraday, but then sold off into the close. https://chartfreak.com/wp-content/uploads/sites/18/2016/06/same-v.jpg 550 922 Alex - Chart Freak https://chartfreak.com/wp-content/uploads/sites/6/2013/04/black_logo.png Alex - Chart Freak2016-06-21 11:59:242016-06-21 12:01:43June 21- Groundhog Day?